I’m a terrible mother. Horrible. There, now that we got that out of the way, let me tell you why I am a terrific one. Today I took my daughters over to the local tattoo shop and we got matching tattoos. Yes, yes, TERRIBLE mother. I thought we established that already? Sheesh. Listen, I know this place, I know the owner. It’s a clean, decent, reputable establishment that is not in some dark alleyway. Give me some credit will you? Listen to the reason and you will agree with the terrific part, (or not) but it’s what you SHOULD have done if you were me, living my life. 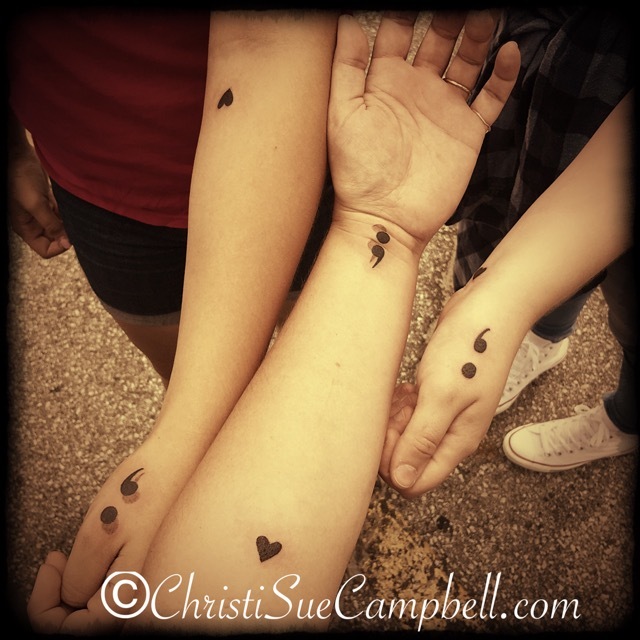 If you haven’t heard of Project Semicolon, then let me educate you. It is quite literally a full out movement of hope, all begun by one woman who was simply intending to honor her dad. It is a tattoo or even just a sharpie marker tattoo of a semicolon on a wrist or other area. Simple, small, and yet crazy powerful. We’ve done the sharpie version. We are ready to commit to a permanent version. The website www.projectsemicolon.com says it this way… “A semicolon is used when an author could’ve chosen to end their sentence, but chose not to. The author is you and the sentence is your life.” They are a faith based movement dedicated to presenting hope and love for those who struggle daily with depression, suicide, addiction and self-injury. Their sole existence is to bring awareness to mental illness and to encourage, love and inspire those who live with it or even just love someone who does. Linds watches as she has her tattoo done. She wanted to be the first to go, since today was for her. My daughter, Lindsey, struggles and battles Bipolar Disorder and OCD along with some anxiety and a personality disorder. Each day is a hard day. That’s just a fact. But she is still choosing to get up each day and face it. Her sister and I both love her in ways that only a sis and mom can. It’s a girl thing. We have a wicked tight bond, the three of us, and when I introduced this website to Lindsey her whole face lit up. Her sister was indignant that she was left out and she demanded to be a part of it. I told her I never intended her to be anything but included. I just hadn’t shown her the website yet! For warriors, support is critical. It’s for important to know someone has their back. Lindsey will never wonder if her sister and I have her back. She will look at her hand and she will see her tattoo and know that the three of us are connected in a special way, remember our day of bonding, needing only to trace it to gain some needed strength. 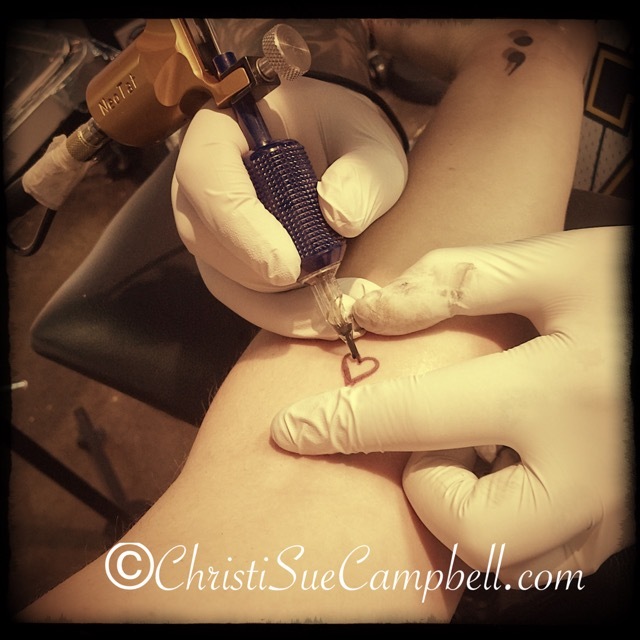 Along with the semicolon tattoo, I am gifting each girl with a little heart, about the size of a pinky finger. It is to be placed anywhere they want it, but in a place they can readily see I used to use a sharpie and pit one on their hand or arm when they were scared about a test, school, or when they just needed a “mom hug” to take with them as they went off on their day. This time we are making it washable and forever. It’s a personal reminder that they ARE my heart; that they carry with them my unconditional love everywhere they go. I love them forever, always, and that there is NOTHING they can ever do that will make me stop loving them. Simply NOTHING. Alli distracts herself with her phone while she is inked. Nothing compares to broken bones and the pain of soccer injuries and physical therapy. This was nuthin. It’s a visual reminder that they can come home, no matter what choices or mistakes they might have made in life, and to know that I’ll have their backs. Life is messy. Choices are hard to make. Sometimes we make the wrong ones. Come home, anyway. I’m always gonna be there. I don’t care if they are 18, 28, or 58. That tattoo won’t wear off and neither will my love for them. If at some point they need me, and I am no longer here residing on this green earth, then they only need look at it to know I’m still only a heartbeat away, loving them from above, still supporting them. 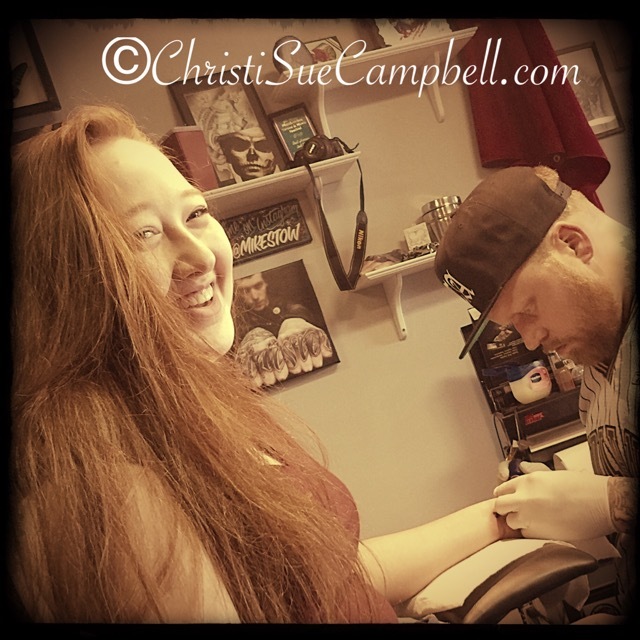 Yes, I took my two daughters, who are 15 and 16, to the tattoo shop and we got tattoos, but the question wasn’t ever, “how could I,” but instead, “how could I NOT?” My beautiful girls are here and this is not in “memory” of anyone. This is to strengthen us and to empower us to do hard things, because we are still alive to do them. There is a beautiful song I will play them. An amazing friend sent me the link the other day and I have been in love with it ever since. As long as we are alive, we are going to live like it. We are going to remember that this is just the beginning, choose to not end our sentences, to just hold on tight, get through the night, and believe that this is not the end. No one has to get it all perfect, or get it all right, we just have to get up each day and try. Put one foot in front of the other, hold on tight, ride the ride, let the day have it’s way, and best of all…come home again. I love you girls. We can do this. We’ve got this! Nothing but tears for you over here, Mama. This post made me cry (and I’m on an upward swing, so usually I’m off on Amazon spending money I don’t have! I am bipolar II). I have been wanting to get a tattoo for quite some time, and nothing ever felt quite right. I had ever decided not to do it at all for lack of being completely certain. Now i know why I wasn’t supposed to quite yet. Because of this post. Because of this movement. I have bookmarked the website, and will be reading up further, and I suspect I shall have a semi-colon of my own by next week. Thank you for sharing. Your daughters are brave and have a selfless mother. You have no idea what your comment means to me. I’ve been in a really hard place as my daughter struggles significantly in a downturn at the moment. I am daily strengthened by this tat. Daily. And there is zero regret. I actually feel relief. Like for the first time the invisible hell we live with is “noted” in some way and with just a glance someone sees that my life is not what it appears to be. The mask is exactly that. A mask. They can know and if they have educated knowledge to what the tat means it is a instant bonding. An understanding. And if they don’t, there is a reason to let the door open for a moment and let someone see. And learn.